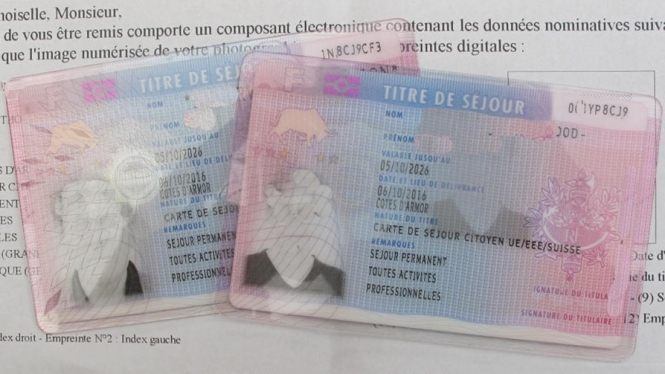 In May the Interior Ministry sent prefectures a reminder of documents required for carte de séjour applications (see here); we have translated it into English for our readers. The following is Connexion’s translation of the Interior Ministry’s latest list in French of documents required for carte de séjour applications. Items which are ticked on the original ministry list are shown here with an asterisk (*) and indicate a document that the ministry says is obligatory in all situations, whereas unmarked items may be obligatory depending on the situation of the applicant. References to CESEDA refer to an important immigration law: Code de l'entrée et du séjour des étrangers et du droit d'asile The original French list also includes some ‘Agdref’ codes. These refer to an Interior Ministry database of information about applications from foreign immigrants to France. IMPORTANT NOTE: On page 31 of our Brexit and Britons in France helpguide, in the suggested wording for a covering letter applying for a card, the word interrompu should read ininterrompu. Our apologies. Special case: in the event of termination of work, provide proof of continued entitlement (art. R. 121-6 of the CESEDA). This may be a certificate of incapacity for work; or a certificate of termination of employment or a letter of dismissal accompanied by a certificate of registration at Pôle Emploi and specifying in all cases the duration of employment; or a certificate showing the applicant is doing a training course. 2.2 Employees: citizen of an EU state subject to a transitional regime [this does not apply to Britons. It relates to citizens of states that recently joined the EU, to whom other EU states may opt to apply restrictions on free movement rights for up to seven years]. *Proof of work: Any document relating to the legal, effective and durable nature of the work. Depending on the nature of the work, this may include proof of: being registered on official business registers (eg. RCS for commercial firms or répertoire des métiers for trades), membership of professional bodies and social security bodies, insurance policies, official report of being appointment to a leading role in a company (procès-verbal de nomination), professional leases, invoices for purchase of equipment, sales contracts, service contracts, turnover declaration form, book of takings and purchases, etc.). Special case - In the event of cessation of work the applicant should provide proof of continued entitlement (article R. 121-6 of CESEDA): either a certificate of incapacity for work; or a certificate showing the person is undertaking training accompanied by a certificate of termination of work specifying the conditions of such termination. *Proof of health insurance: proof of cover by health insurance and, if applicable, maternity cover. (Note: for the first year of stay, the European Health Insurance Card or a European form proving the applicant is still covered by the country they came from, is acceptable). *Proof of financial means: any document that makes it possible to prove the reality of the applicant’s means and the length of time that such means will be available: bank statements, pension slips, etc. (Note: amount required is equivalent to RSA [under 65] or [65 and over] ASPA, calculated according to the composition of the family). *Proof of financial means: declaration or any other equivalent means left to the person’s choice, guaranteeing that he or she has for him or herself and, if applicable, family members, sufficient means to support themselves (no set amount is specified). *Proof of family link: marriage certificate, or birth certificate showing family relationship, or birth certificate of a descendant who looks after the applicant (documents corresponding to the situation at the time of the application). *Proof of the right of residence of the EU citizen the applicant lives with: as applicable to the category to which the EU citizen belongs [could include their carte de séjour if they already have one]. Personal right of residence: the family member must be in one of the situations in points 2.1, 2.2, 2.3, 2.4 or 2.5. For third country nationals (only for renewal of a card): additional documents to be produced: court decision or document relating to the parents' agreement regarding custody of or visiting rights with regard to the children, main courante [report of facts to the police] or court decision (in cases of domestic violence), proof of residence (rent receipts, electricity bills, residential charges bills, etc.). For family members who are dependents of the EU citizen or members of his/her household or who are seriously ill: any document proving material and financial support provided by the host in the country where the family originates from or came from, such as documents from state or private bodies (social services, tax office, banks, insurance, social protection etc) or private persons (statements, letters etc), establishing the reality of the support provided or life within the household; medical certificates establishing the seriousness of the family member's state of health. *Proof of continuous residence for 5 years: one document per half-year period proving continuous residence in France: rent or building charges receipts, utility bills… (if you have been away for periods of between six months and a year continuously, then justify why with evidence of having been posted abroad for work, having done training abroad, having done military service [‘military obligations’ abroad are acceptable whatever length of time], a medical certificate explaining a health reason etc.). Cross-border workers: proof over a three-year period of work in another EU Member State and continued habitual residence in France (returning at least once per week). *A declaration on honour by which the applicant certifies that he/she has not been absent from France for more than two consecutive years since the acquisition of the right of permanent residence (except in the exceptional cases of prolonged absence provided for in Article R. 122-3, ie. military service, posted work etc). *Proof of the continuity of residence of the family member for 5 years: receipts for rent or charges, invoices, bank documents, tax documents etc. (one document per six-month period).